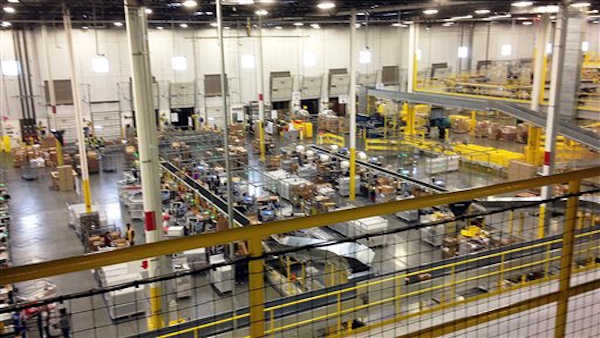 ROBBINSVILLE, N.J. (WABC) -- Residents in one New Jersey town say the holiday rush at a local Amazon warehouse is leading to a traffic slowdown on their roads. Robbinsville Mayor Dave Fried threatened legal action Wednesday after Amazon sent a public affairs staffer to a meeting to discuss solutions to the traffic that's clogged area roads. Fried says the meeting was supposed to include operations officials. NJ.com reports traffic grinds to a halt for miles when the fulfillment center's more than 4,000 employees are going in and out of the facility during rush hour. Fried says the infrastructure wasn't built to handle this much car volume. He hopes Amazon can change or stagger shifts. Fried said the traffic problem is affecting several towns in the area. He said the fact that no operations officials attended the meeting was a sign that Amazon is not taking the problem seriously. "Now featuring the busiest warehouse on the planet, Amazon has dramatically increased the number of workers at the Robbinsville center during its peak hours as it gears up for the holiday rush. Unfortunately, that is double the number of employee "trips" they were approved for by our Planning Board in 2012. One possible remedy we have continuously suggested is having Amazon stagger the shifts of its workers in and out of the complex during those peak hours. Those suggestions have been ignored." Fried went on to say the congestion is causing unprecedented gridlock on local roads, with children unable to get to school and residents unable to pull out of their driveways. He said police data shows there have been 25 accidents attributed to workers coming to and from the warehouse over the past six weeks.